Mushrooms that grow in your yard are not edible and often make your yard unattractive. Mushrooms are actually evidence of fungi in the lawn. They are the fruit structures of the fungi. If you have mushrooms in your lawn, get rid of the them the right way. If you are not careful, you could actually spread the fungi to other areas of your lawn. Walk around your yard and pluck up the mushrooms. Carefully pull by the bottom of the stem to avoid releasing any of the spores in the top of the mushroom. Place the mushrooms in a plastic bag and tie it shut as soon as you are done. Toss the bag out with trash. Rake the area of your lawn where the mushrooms were. This will prepare the lawn for the fertilizer. Apply a 16-6-8 fertilizer at a rate of 6 lbs. per 1,000 square feet of space. This is the rate recommended by the University of California. It will speed up the decomposition of the organic matter in the soil, which prevents the growth of new mushrooms. Rake the area again, and then water it. This will set the fertilizer into the soil. Always follow the safety precautions on the fertilizer label before use. Never eat a mushroom unless an expert says it's edible. 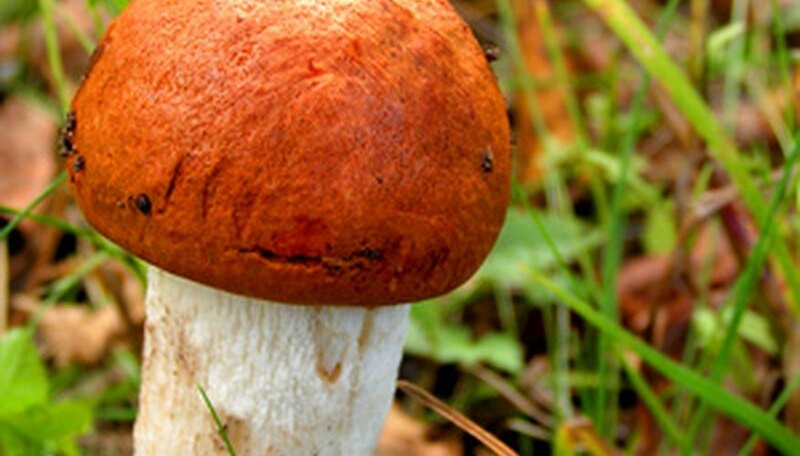 Many mushrooms are poisonous. How Does a Mushroom Grow?